Did this video of Andre Esterhuizen’s tackle training just leak from the Springbok camp? Springbok coach Rassie Erasmus’ comments dripped with sarcasm after Owen Farrell's armless, unpunished 'tackle' from Saturday's clash at Twickenham. 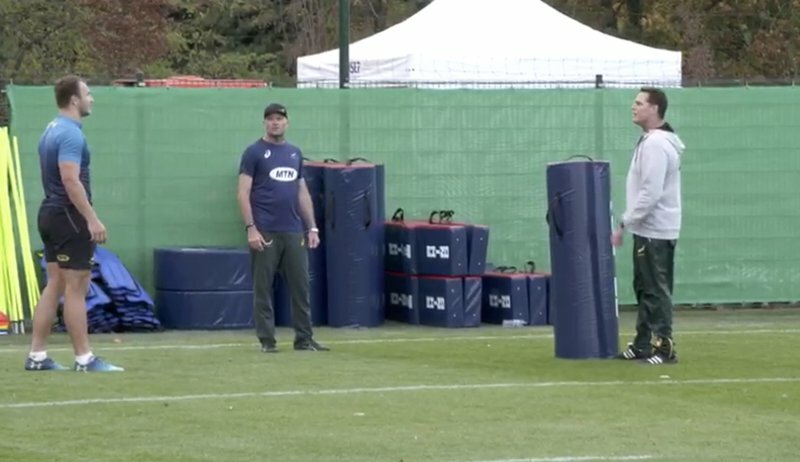 The Springbok coach is clearly still in a sarcastic mood after new video footage emerged which shows Erasmus teaching Esterhuizen in Paris on how to execute a “successful” tackle. The world watched how Farrell executed a tackle with no arms on Esterhuizen but Aussie referee Angus Gardner decided not to award the penalty to the Boks. The Boks will tackle France in Paris on Saturday (Kick-off 22:05 SA time).